PRG (Production Resource Group UK) has become the latest high profile lighting hire company to invest heavily in SGM’s new generation LED fixtures. They have purchased 46 of the P-5 RGBW wash lights for their busy Autumn and pre-Christmas outdoor season, as part of a general LED inventory upgrade. Paul Weaver, head of EU asset management, says the company has enjoyed a long and successful relationship with SGM over the years, and this marks the latest chapter. The P-5 won a competitive shoot out with a number of other leading LED floods — including the Palco. The P-5 certainly has punch aplenty. Incorporating 44 RGBW 10W LEDs, the fixture offers CTC and White Balance control, with just 400W power consumption and LED source life expectancy of 50,000 hours. Stretching the output-to-consumption envelope by providing an overall efficacy factor of 52 lumens per watt (channelled through the 15°, 21° and 43° lens options) the green credentials of the P-5 raise the benchmark considerably. Over in the States PRG has also been having success with SGM’s new generation products, notably when 34 XC-5 LED strobes were specified on the Pink tour earlier this year. 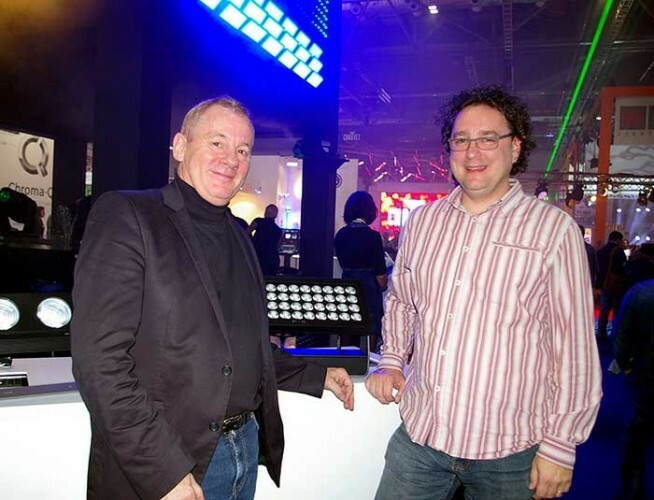 In picture: SGM CEO Peter Johansen with PRG’s Paul Weaver and the P-5 at PLASA 2013.